Today’s social media allow us the ability to connect with people with similar likes/dislikes, lifestyles or, in the case of my family, parents who have children with similar medical challenges as mine. This network I have written about previously in my post about Community but it has never been more essential or active as it has become after the earthquake and tsunami hit Japan recently. Displaced families across Japan are struggling to find shelter, electricity, food and medical care for their everyday needs. Families with children with complex medical needs are more frantic in their need for these basic essentials. After the quake & tsunami struck, families reached out to each other through social networks and online media. Once family member status had been determined, families of children with complex medical needs reached out to their online community of support to help them in their advocacy for the health and safety of their child. When even the basic needs of food, water and electricity are hard to secure, their only choice would be to relocate their family to another region of the world- no small task with a child who often requires direct medical intervention throughout the day and mechanical medical intervention overnight. Two of these families have reached out to our community and we, family members logging into Facebook at home, on the road, or from the hospital, took up the charge to advocate for these families from our position of safe homes the world over. We answered the call by writing to or contacting local hospitals, media outlets, senators, top government officials and government agencies in charge of allocating resources in areas of crisis the world over. We families, armed with coffee mugs and keyboards, have made a difference in the lives of one Canadian family from Japan who has since relocated to their former home in Toronto. We continue our efforts for another US family still stranded in Japan, concerned for the future of their 14 month old child. Families of children with special medical needs are uniting together to save the world in our pajamas! As most of you know, I am not now, nor have I ever been married. The topic of one day meeting my future husband comes up on occasion from family or friends and I regularly respond with “If he drops out of the sky…” given my schedule and availability! 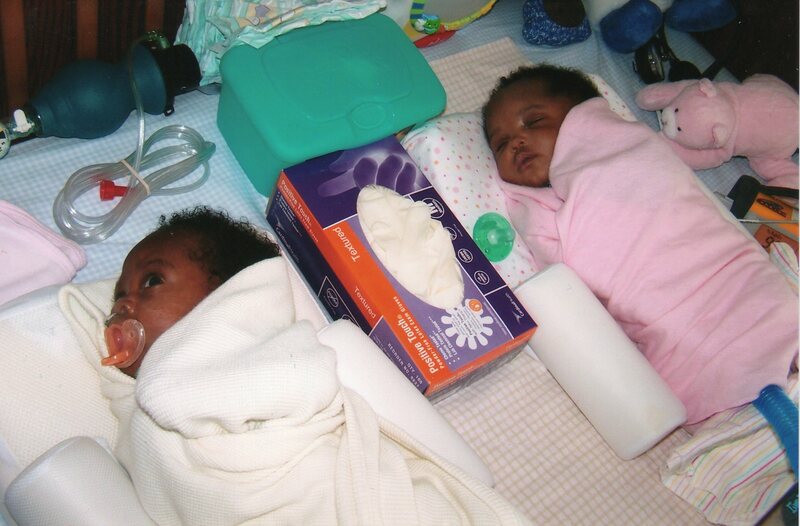 5 years ago March 2nd my twins entered the world of the living- one at delivery, the other post-resuscitation. Their early life was marked with intubations, shift changes, blood draws, substance withdrawal assessments. They struggled and fought through pain, breathing difficulty and a lack of a single parental resource. The first year was spent healing and sickening, healing and sickening. Operations for trach placements and a gastrostomy tube placement after multiple replacements of their nGs. Their strength was tested at every turn, one step forward, three steps back. 6 weeks in the hospital is how my son spent his first Thanksgiving and Christmas. Thank goodness for a wonderful foster family and caring nursing staff. 5 years later, some of the struggle remains, but life has improved to more living, less medicine. My children continue to require tracheostomy tubes, but celebrated their first birthday ever without one of them having any type of G-tube. They both enjoyed grain-free pizza & cake with their younger sister and Nana I & a couple cousins. A family has been made for them; 4 full birthdays of family. I am reminded how much I love them and how far we have come, each and every day. The last year, ages 4 through 5, has included regular doctor visits but no in-patient hospital stays. It is their record-year for health status that has been possible to maintain at home. Weight has been gained, height has been gained, vomiting has been reduced to “rare” status. Bikes & helmets & games & singing & dancing & running & playing – EVERY day. I have no word but ‘miracle’ to describe their status in life today- a miracle of the universe. Even as struggles remain and challenges are left to face- life is good nay, great. I am hoping the wonder of 5 will add to the celebration! Happy birthday, Adrien & Tavish!